Download "Thanks for your interest in going solar at one of our group off-site solar farms." 2 Page 2 of 15 Eddy Road, Chester, July 2015 Groton #1, December 2014 Our current and future farm sites Our Sites Groton #1 & #2 Chester Waterford g Up next: Groton #2, Groton Timberworks 2126 Scott Highway 650 Panel Farm, permit issued May Construction fall Permits in process: Waterford 150 kw Chester 350 kw One solar farm s panels are generally sold to 15 residences, one or two larger commercial companies, one municipality and one non-profit. Our company, Green Mountain Community Solar LLC (GMCS) is headed by Jamie O Connor and Bruce and Steve Genereaux. Steve and Jamie, both healthcare professionals, live with their family on a solar-powered hillside farm in Ryegate. Bruce, a small business owner/operator and financial consultant, lives in Norwich. We own panels in Groton #1 and Eddy Road for our residences and in all GMCS solar farms as business owners. 4 Page 4 of 15 on the loan are similar to the credit value. Once the loan is paid, then your credits continue. This is a way of paying little or no money out and still going solar. 4. Your Savings: Come in the form of a monthly credit to your utility bill or a check. 5. 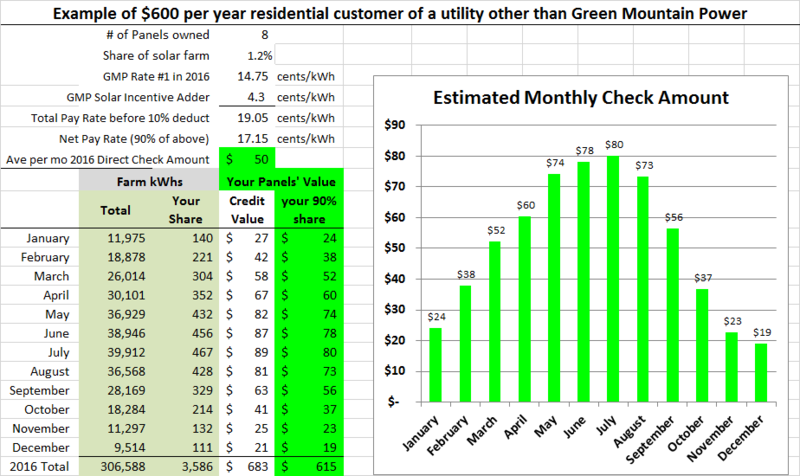 GMP Credit Elements: For the first ten years the amount of your credit is calculated by taking the kwhs produced by your panels times the GMP Rate #1 ( cents/kwh as of October 2015) plus the VT Solar Adder solar incentive (4.3 cents/kwh) plus (if you are a GMP Rate #1 residential customer) the efficiency charge of 1.17 cents per kwh. Ten years after the farm is connected to GMPs grid, the Solar Adder ceases and the credit value is equal to the kwhs produced times only the then GMP Rate #1 plus the efficiency charge (if you are a GMP customer) for each monthly bill. This Rate #1 is proposed by GMP and authorized by the VT Public Service Board. The risk that the GMP Rate #1 would go down exists, but if that happened that would strand GMP assets and contracts. The likelihood of GMP s Rate #1 increasing depends on the markets for electricity in New England and costs of future generation capacity of GMP. 6. Future GMP Rates: Our research indicates that the GMP Rate #1, at which your credit value is dependent, will likely rise at an average of 2.5% per year starting in Our basis is that GMP s rate increases have averaged 2.5% per year over the last ten years. If one assumes that GMP rates do not increase, then your life of project return declines by approximately 2% and payback increases by one year. 7. All solar farm fields have annual decreases in kwh output this is industry standard. Our panel manufacturers warrant theirs at 82.5% of rated capacity after 25-years, a.6% decline per year. Since the GMP rate is expected to climb faster than the panels output degradation rate, your savings increase each year. Our 30 year cash flow estimate disclosure shows these elements. 8. During a particular year, your credit will be greater in summer and lower in winter, averaging out over the year. This is what is called net metering. 9. Our business model: We sell electric credits from panels we own in the farm to pay for maintenance of the field. We purchase and own a minimum of 30% of the panels. Additionally, we secure funding for inverter replacements required in year 15. You pay only once. These aspects and commitments that we make create an incentive for us to be sure that the field operates as expected. 6 Page 6 of 15 price is $2.66/watt (DC). Our research into our Community Solar competitors rates shows they range from $4.00/watt (DC) to $2.22/watt (DC) after ITC. Be sure to fully understand the relationship you d be entering and request a detailed cash flow forecast to accurately compare prices. Does the competitive quote offer a buy out? And, if you are looking at placing panels at your home or business, know that every home installation price will vary depending on your roof, your yard and the productivity of your particular site may vary from the closer-to-ideal siting allowed by our off-site solar farms. 2 Do I own the panels? Do I get a state rebate? Does my purchase qualify for the federal investment tax credit? What about Renewable Energy Credits? Yes you own the panels. Your ownership entitles you, by law, to take the federal tax credit secured by filing form 5695 (or form 3468 if you are a business). There are no VT or other state rebates of which we are aware that in which off-site group solar farm panel ownership would qualify. By default, we retain the renewable energy credits (RECs) associated with our solar farms unless directed by you to have them retired, in which case we must charge you a 20% premium on your panel price. 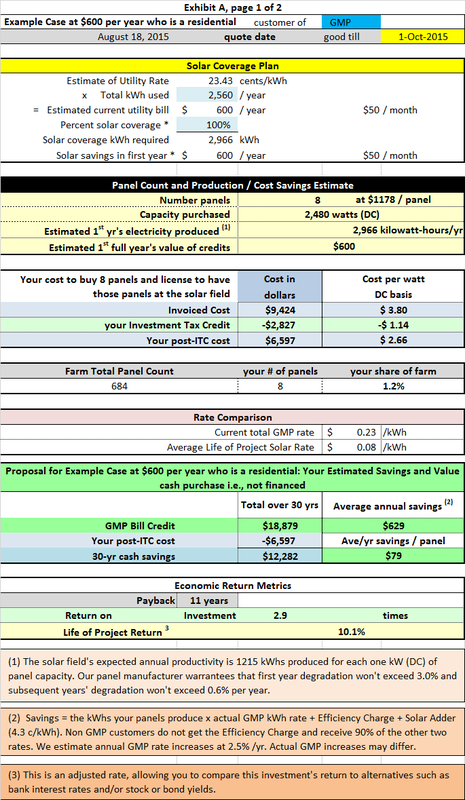 3 Does solar make financial sense? By our calculations, at current pricing, the value of the credits you earn from your panels and license would return the same as if an institution similar to a bank paid you 10% each year on your panel purchase price. This equates to our initial cost being repaid after 11 years. If energy prices increase faster than the 2.5% per year we ve assumed (after 2017), your returns may be higher and payback shorter. 4 What if I move? Your monthly credit is associated with your GMP account number, or if you are not a GMP account holder (or move out of GMP territory) if follows your address as you will receive a check each month. Move to a new GMP territory house, get a new GMP account number and we ll direct GMP to credit your new account. Or, if you move out of GMP territory you have four options: 1) we ll buy you out at fair market value in either May or December; 2) you can sell to another GMP account holder; 3) you can elect to receive a check for 90% of your credits value that we would assign to our corporate partners or; 4) you can donate your share to a non-profit located in GMP s service area. 7 Page 7 of 15 5 Can I sell my panels and license and assign credits to someone else? Yes, we can make arrangements for the shift of credits to another GMP customer. Some customers choose to donate to non profits and churches. Sale or transfer of their panels before five years may trigger recapture of any federal tax credit claimed 6 What type of panels and inverters will you use? Panels and inverters will be made by tier 1 manufacturers. We cannot promise the exact panels or manufacturers as our installer may change this on us. 7 I live in an apartment/condo, will Green Mountain Community Solar work for me? Yes, our approach works well for any home owner or tenant and is especially attractive for people who, due to their living situation, have been prevented from owning solar in the past. 8 What happens if I die? Your panels are like any other asset and can be willed to your heirs. Your license can be assigned to a relative's GMP account or you can donate it to any other GMP customer s account including charities. If you are not a GMP customer, then your monthly check associated with your license will be sent where you designate. 9 What happens if I no longer want to be part of Green Mountain Community Solar? We agree to buy back your panels at fair market value anytime. In your contract you will be given the exact expected buyback price for future years. See note above on implications of sale timing. 10 What happens to my panels, license and credits if you go out of business? The project assets (your panels, the wiring, the racks) are insured and will continue to produce electricity and credits for your account regardless of our business s status. Your security is that the credits from our ownership of a minimum 30% of the farm s panels can be secured by the licensees and used to fund maintenance and pay for inverter replacement. Additionally, you and your fellow panel owners have the right to appoint a new manager who will have access to the funds from sale of excess capacity and the inverter replacement funds should we not do the job you want. These items are specified in your license agreement. 11 How can I see how much electricity my share is producing each month? The farm s production is shown on our website and you will be given access to GMP s records. 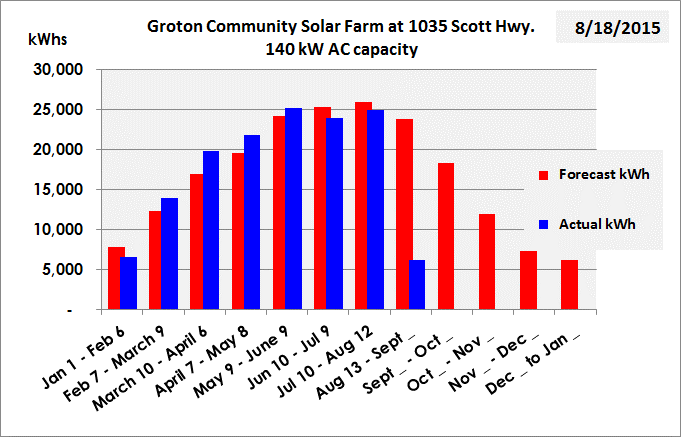 8 Page 8 of Results of Groton #1 Farm These results are placed here to give you a sense of how our solar farms have performed against predictions. Red (lighter colored) lines indicate predicted kwhs for the geographic location of the Scott Hwy solar array and its particular characteristics 22.5 degree, pointing south, fixed solar panel array with a DC to AC ratio of 1.21 and Canadian Solar 260 watt panels with SMA 20 kw inverters. Data source for the predicted output is NREL in Golden Colorado. NREL uses 10 year historical weather data, and in our case, that of Knapp Airport in Montpelier, approximately 20 miles west of this site. Groton Timberworks is 1 mile east of this site and uses the same predictions and panel orientation and has similar solar exposure. The blue (darker lines) are actual results of the project year to date. Utility rates have not changed and weather does change from predicted norms, so the fact that the project is ahead of estimate now does not mean that it will stay that way. 10 Page 10 of 15 GMP Customer (Page 1 of 2) 1. Solar savings objective is $600 per year. 2. Customer takes tax credit in following year. 3. Investment in 2015, savings start first of 2016. 11 Page 11 of 15 GMP Customer (Page 2 of 2) 1. Solar savings objective is $600 per year. 2. Customer takes tax credit in following year. 3. Investment in 2015, savings start first of 2016. 12 Page 12 of 15 Non-GMP Customer (Page 1 of 3) 1. Solar savings objective is $600 per year. 2. Customer takes tax credit in following year. 3. Investment in 2015, savings start first of 2016. 13 Page 13 of 15 Non-GMP Customer (Page 2 of 3) 1. Solar savings objective is $600 per year. 2. Customer takes tax credit in following year. 3. Investment in 2015, savings start first of 2016. SOLAR LEASE GOOD IDEA ARE YOU NERVOUS ABOUT SIGNING THAT SOLAR LEASE OR PPA CONTRACT? WELL, YOU SHOULD BE! Don't Think For A Moment That It's As Simple As Sign Here And They'll Reduce Your Electric Bill. SunRun Power Plan. Contact us at 480.994.1440 or SunRun@americanpv.com to find out more!